Last weekend I ran my first road race in about 3 and a half years. Not only was this my first race in quite some time, but it was also the first race I’ve competed in since moving here to the Great White North. During my previous life as a desk jockey in sunny Sacramento, I spent a lot of my free time training and racing. But with the wacky schedule we’ve been living since the day we arrived here, I had quickly given up any hope of being able to wake up early enough to make an 8am race start, let alone find enough time to properly train for an event. It actually took a morning spent watching Chris compete as a last-minute member of a triathlon relay team to realize that, while I certainly won’t be able to compete the way I used to, I can certainly squeeze in an event or two during the racing season. Not being one to waste any time, I signed myself up for a 14K the morning after Chris’s race. Six weeks later I crossed the finish line faster than expected and with a huge smile on my face. It feels so good to be back! Once of my biggest challenges with racing has always been my race day nutrition. I get a bit of an anxious stomach whether I’m racing a new distance or simply running along with a newbie runner on her first 5K. Something about the race day excitement, I suppose. So, despite following the usual advice of not trying anything new on race morning, I’ve still had some pretty spectacular nutritional failures. This time around, however, I was smart enough to stop blindly following the advice of “experts” and to pay a little more attention to what actually works for me. Not surprisingly, I’ve found that I have a lot more success eating “real” food before and during my tough workouts, rather than pre-packaged energy gels and drinks. Go figure. It certainly takes a little more planning and effort than grabbing an energy bar for breakfast, but a little extra time spent preparing food in the morning is more than worth it to ensure a happy tummy. This smoothie is by far my favorite recipe that came out of the whole-foods-running-experiment I had been conducting on myself for the past month and a half. It has plenty of carbs to get you going, and some protein and fat to sustain you for the later miles. And the best part, of course, is that it’s super tasty as well. It’s definitely not something I reserve solely for running days. I hope you give it a try sometime either before a workout or as a weekend treat. If you’re using a high-speed blender you can skip soaking the cashews. However, if you are going to use this as a pre-workout meal I’d recommend that you soak the cashews anyway for ease of digestion. I’ve never used avocado in my fruit smoothies, but what a great idea! 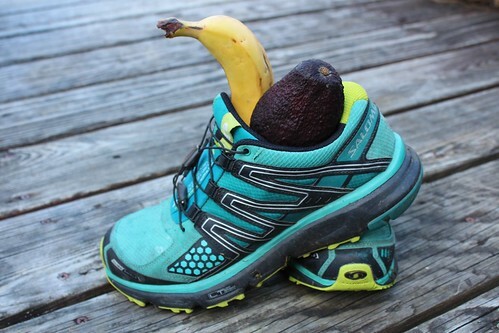 Your picture of the fruit in a sneaker really caught my eye. Thanks for the recipe and congrats on your race! Thanks! I’ve been using avocado in a lot of my smoothies lately. It gives them a super creamy texture without adding any strong flavors. I hope you give it a try! 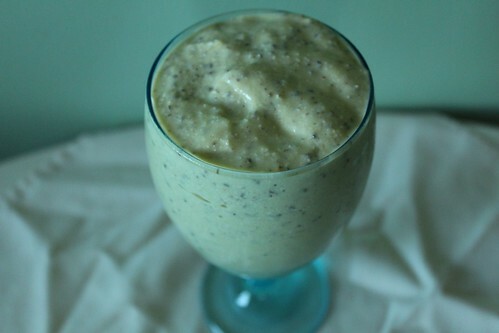 Sounds like a lovely and hearty smoothie, tropical fruits & avocado, I’m in! And congratulations on your race!